After back-to-back viewings of Hitchcock “Signature Collection” members Dial M for Murder and Foreign Correspondent - and knowing Strangers on a Train waited in the wings - I startedto wonder when I’d encounter the inevitable stinker. Not that I wanted to find one, mind you, but no matter how great a legend may be, even the best flop occasionally. Heck, even Mickey Mantle hit .237 one year. 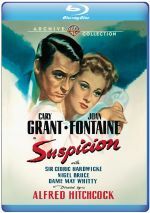 To avoid a clunker if possible, I decided to stick with what appeared to be a safe bet: 1941’s Cary Grant and Joan Fontaine vehicle Suspicion. Grant was fantastic in some of my favorite Hitchcock “hall of fame” movies like Notorious and North By Northwest, and Fontaine was fresh off the lead in Rebecca. So much for the safe bet, because folks, Suspicion is a stinker, especially in Hitchcock terms. The film boasts a good premise. A woman falls in love with a man whom she knows very little about, only to make some disturbing connections about him in her own mind, and start to suspect that he might be a murderer. It’s sort of Spellbound meets Shadow of a Doubt. Johnny (Grant) and Lina (Fontaine) become acquainted when a group of single women in a rural English town introduce them on their way to church. Lina has had her eye on Johnny for a few days, as he always appears in the society pages of the local paper, and they’d encountered each other a couple of days earlier. Johnny goes away for a while, leaving Lina to yearn for him and wait for his phone call. Because he’s a total player, he doesn’t ring her for three weeks. When he does call, they reunite, and Johnny demands that she marry him. Mind you, they’ve spent all of a few hours together, and this is only ten minutes into the movie. Because she’s a spinster, she agrees, and they go on a whirlwind European honeymoon. When they get back, they arrive at a palatial home, fully staffed with servants. Lina is thrilled…until a telegram arrives demanding that Johnny pay back a thousand pounds he borrowed to go on the honeymoon. Sounds pretty promising, right? Perhaps that promise only contributes to how disappointed I was by the film. It’s like watching a super-talented wide receiver who takes plays off in the middle of the game. It’s ugly because of the limitless potential he has. The ending and the relationships aren’t the only problems; they’re just the most obvious ones. There’s far too much soap opera technique here, with an overloaded swelling score and a ton of accompanying earnest looks from Lina that are meant to convey pretty much any emotion. The film takes a long time to really get rolling, and when it does, it ends inside of fifteen minutes. The performances are uncharacteristically over-the-top, particularly Fontaine’s quivering Lina, which only makes it more shocking that she actually took home the Academy Award for this role. There’s little humor in the story, something decidedly unusual for this director. Suspicion appears in an aspect ratio of 1.37:1 on this Blu-ray Disc. The movie came with a satisfying visual presentation. Overall sharpness looked fine. A few slightly soft shots materialized, but these remained in the minority, so most of the film came across as accurate and well-defined. I saw no shimmering or jaggies, and edge haloes remained absent. No signs of print flaws cropped up here, and the movie exhibited a nice, natural sense of grain. Blacks showed positive depth and density, while low-light circumstances offered good clarity for the most part; a few slightly dark shots appeared, but those remained in the minority. The transfer held up very well over the last 75 years. I also felt pleased with the DTS-HD MA monaural soundtrack of Suspicion. A perfectly acceptable track for its era, the audio didn’t do anything particularly special. Speech sounded a little brittle but the lines lacked edginess and remained intelligible. Effects played a small role in this talky flick. Though they lacked much life, they were clean and without any difficulties. Music was adequate. The score seemed typically thin but sounded decent overall. The soundtrack worked fine for a movie from this one’s era. How did the Blu-ray compare to the last DVD from 2010? Audio sounded a bit warmer and smoother, and visuals came across as tighter, cleaner and more vivid. The Blu-ray presented an obvious upgrade. 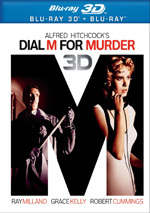 In addition to the film’s trailer, the disc includes a featurette entitled Before the Fact: Suspicious Hitchcock. This 21-minute, 36-second piece provides comments from Hitchcock at Work author Bill Krohn, film historians Richard Schickel and Robert Osborne, filmmaker Peter Bogdanovich, Hitchcock’s daughter Pat, Psycho II director Richard Franklin, music historian Christopher Husted, and composer Franz Waxman’s son John. “Fact” looks at the source novel and its adaptation, cast, characters and performances, story elements and visual techniques, the film’s original ending, score, and its reception. Lesser Hitchcock, Suspicion suffers from more flaws than one expects from the great director. The movie tends to stretch credulity and become a bit of a chore to watch. The Blu-ray provides very good picture as well as acceptable audio and a moderately informative featurette. This turns into a strong presentation of a mediocre movie.